The following table lists jQuery methods to get or set value of attribute, property, text or html. attr() Get or set the value of specified attribute of the target element(s). prop() Get or set the value of specified property of the target element(s). html() Get or set html content to the specified target element(s). text() Get or set text for the specified target element(s). val() Get or set value property of the specified target element. The following figure shows various jQuery methods to access DOM element's attributes, properties and values. Let's have a quick overview of important methods to access element's attributes. jQuery attr() method is used to get or set the value of specified attribute of DOM element. First of all, specify a selector to get the reference of an element and call attr() method with attribute name parameter. To set the value of an attribute, pass value parameter along with name parameter. In the above example, $('p').attr('style') gets style attribute of first <p> element in a html page. It does not return style attributes of all the <p> elements. The jQuery prop() method gets or sets the value of specified property to the DOM element(s). First of all, specify a selector to get the reference of an element(s) and call prop() method. Supply "name" parameter to get the value of that property. To set the value of a property, specify a value parameter along with name parameter. In the above example, $('p').prop('style') returns an object. 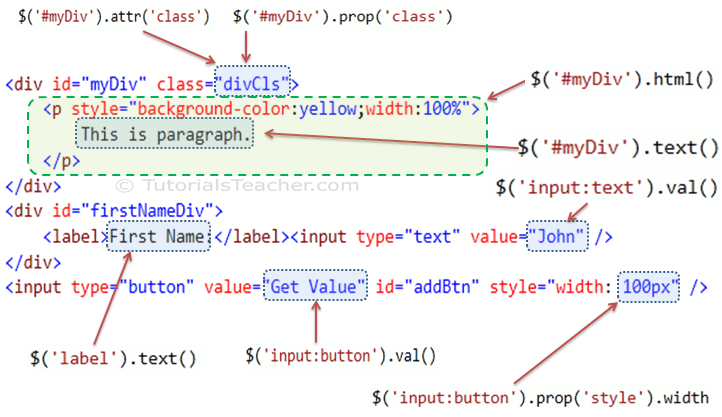 You can get different style properties by using object.propertyName convention e.g. style.fontWeight. Do not include '-' as a property name. The jQuery html() method gets or sets html content to the specified DOM element(s). First of all, specify a selector to get the reference of an element and call html() method without passing any parameter to get the inner html content. To set the html content, specify html content string as a parameter. The jQuery text() method gets or sets the text content to the specified DOM element(s). First of all, specify a selector to get the reference of an element and call text() method to get the textual content of an element. To set the text content, pass content string as a parameter. $('#myDiv').text(); //returns "This is paragraph." $('p').text(); //returns "This is paragraph." Please note that text() method only returns text content inside the element and not the innerHtml. The jQuery val() method gets or sets value property to the specified DOM element(s). First of all, specify a selector to get the reference of an element and call val() method to get the value of value property. To set the text content, pass content string as a parameter. //set value of input text to "Steve"
In the above example, val() method returns value of "value" property. If element does not support value property then val() method returns null. Visit Manipulation methods reference to know all the jQuery methods to manipulate attributes. jQuery attribute methods allows you to manipulate attributes and properties of elements. Use the selector to get the reference of an element(s) and then call jQuery attribute methods to edit it. Important DOM manipulation methods: attr(), prop(), html(), text(), val() etc.